How to Decide If It’s Time to Finish or to Frog a Stalled Project. Not all knitting projects work out and some just stall or hibernate. Like a broken down car, I kick the tires and wonder if it’s worth sticking with it or perhaps it’s time to move on to something new, maybe a more energy efficient model this time? Long after I’ve moved on, unless the previous one has been frogged, it is still there – up on blocks in the backyard. 1) How much time and effort have I invested in this project so far? Would it break my heart to frog it (if so, can I make it into something else – handbag, baby blanket, toss pillow cover)? 2) Have my needs changed since this project stalled or is there still a suitable purpose, desire, or destination for it? 3) Is it in good condition and quality stitch work exists? 4) Do I already own enough yarn to complete the project? If not, is the yarn still available and how expensive would it be to purchase what I need? 5) Do I have time in my schedule to finish this project? If not, is there something else can I make with it in its current condition or minimal finishing work? 1) Started on April 1, 2009, I got as far as the neck for this top-down sweater based on the Ingenue pattern from Custom Knits. 2) I think I would use it when complete since it is a versatile, machine-washable jumper. 3) No dropped stitches, unraveling, or fraying shows. 4) I bought an ample supply of Tivoli Buzz, a charcoal tweedy acrylic, which I still like. 5) The time can be made as with any project, but I am intimidated by my first jumper in the round. 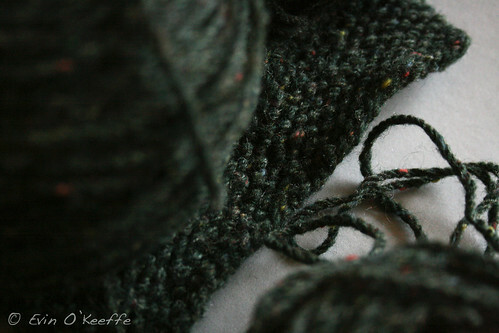 Conclusion: I will finish this sweater, hopefully before October of this year. 1) I am only about ten rows into this scarf, but it took me a long time since it’s slip-stich. 2) I started making this for my brother after he said he’d love a handknit green scarf made by his ‘Sissy’. He still resides someplace that gets winter, so it would be useful. 3) It slipped off the needles so the stitches must be picked back up with a row or two lost as a result. 4) I have the Kerry Woolen Mills Aran yarn to finish it. 5) The slip-stitch pattern is time consuming and a challenge to get in the rhythm when I am also knitting regular projects. Conclusion: Because of the time-consuming nature of the stitch, I believe I will frog this project and restart it as a garter stitch lengthwise scarf. 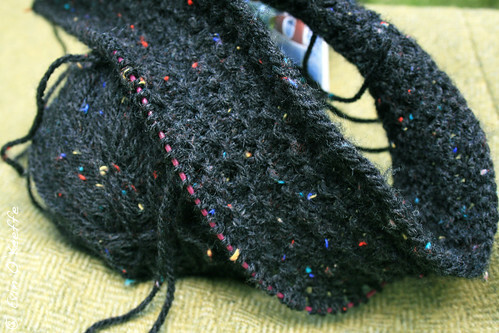 It pains me since I love the look of the slip-stitch, but this choice may mean it actually gets completed so my brother doesn’t have to go another winter without a lovingly hand-knit scarf. 1) Started in Autumn 2009, this slip-stitch blanket has 300 stitches that I cast on. It stalled once I needed the needles for a different project. 2) The design was modeled after one we saw on a murder mystery. The objective was to use acrylic yarn scraps at least three yards in length to put together a long-term project that would ultimately make a nice cosy blanket for watching murder mysteries on the sofa. Though we have two other blankets that serve the same purpose, I think having a hand-knit one would be nice. 3) All existing stitches I did are top notch and in good condition. 4) The project uses odd yards of lovely DK just sitting around. I have plenty. 5) It would take some time to complete, but seems like a good use for leftover yards and with that in mind would be a long-term project if it were to continue. Conclusion: All things considered, I am going to finish this blanket. Well, that’s all for evaluating my stalled projects. I’ll be back soon with an update. You can always see what I’m knitting in my Ravelry Projects. Do you have stalled projects of your own? How do you decide if you’ll continue with them or vier off-course and adapt or frog? This entry was posted in Create, Knitting | Crochet, Tutorials | Patterns and tagged crafts, how to, Knitting, sewing, upcycling. 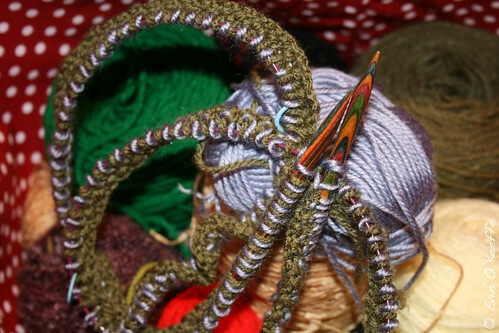 I once started a hat for my cousin…it was a complicated, “designer” hat, and since I had never tried knitting with double-pointed needles OR knitting a hat, I restarted three times, and got lost in the middle. After I made my first pair of mittens (months later), I decided to unravel the yarn and start green mittens with the yarn I was going to use. She lives in a cold climate, anyway.